It all started on November 17, 1978. That’s the day the infamous Star Wars Holiday Special aired for the first and last time. In-between live action scenes that lurched from soul-crushing tedium to wince-inducing sentimentality (Bea Arthur sings! ), there was a brief cartoon segment that featured Luke Skywalker, Han Solo, and a character who would become one of the most famous members of the Star Wars universe: Boba Fett. Though it was his first appearance, Fett’s fame owes little to the special. The cartoon was short and Fett was little more than a standard villain. The character wouldn’t make his live-action debut until The Empire Strikes Back over a year later. 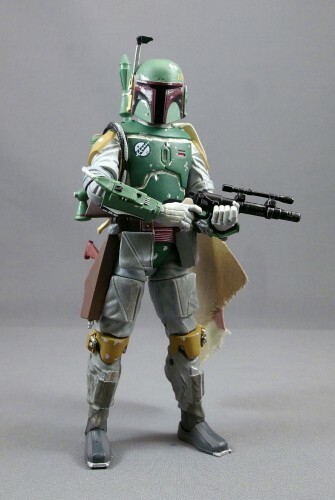 While actor Jeremy Bulloch’s depiction of Fett as a nearly-silent badass in awesome armor did much to endear him to audiences, his true fan base was well-established by the time the film hit theaters. Who were these early Fett fans? Action figure collectors, of course. 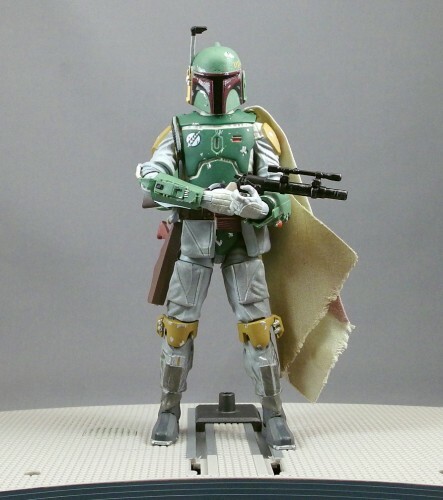 Fett was initially offered as a mail-away figure by Kenner in 1979. Almost immediately, Boba Fett’s popularity exploded. For today’s Star Wars license holders he’s as essential as Luke, Leia or Han Solo. 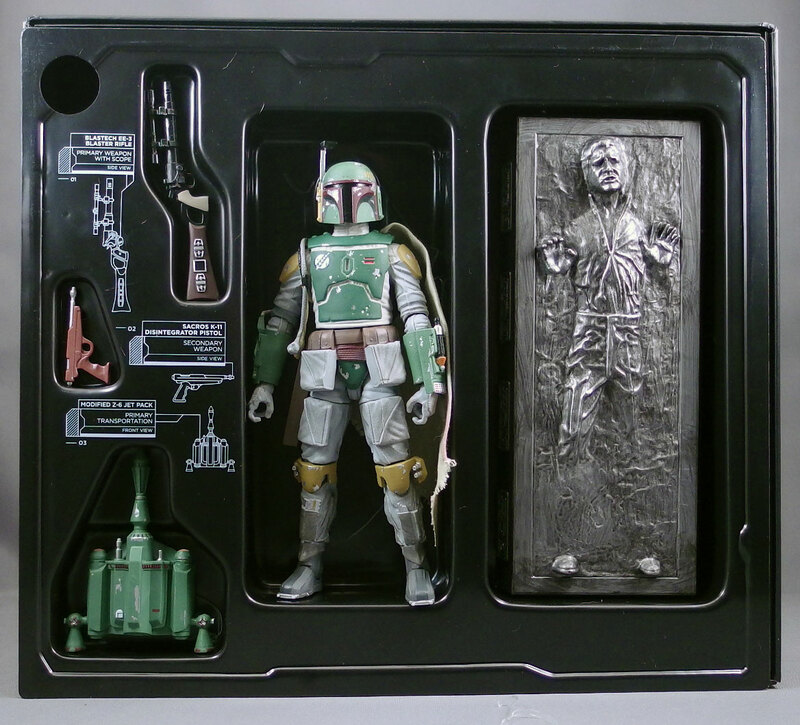 It’s quite telling that the first figure out of the gate (even if it was an exclusive) was Boba Fett. While other SW characters might be better known by the public at large, Boba Fett is the quintessential Star Wars action figure. It would be disingenuous of me to claim I’ve been waiting for a 6″ Boba Fett figure my whole life. Really, I’ve only been waiting for it since the early 2000s, when McFarlane Toys and ToyBiz’s Marvel Legends and Lord of the Rings cemented the 6″-7″ scale as my favorite scale range. But still, a decade is nearly a third of my life, so it was still a bit of a wait. Hasbro released their first 6″ Star Wars Black figure with a somewhat controversial splash at the 2013 San Diego Comic Con. Though Hasbro had already intimated Boba Fett would get a regular release (and indeed, he’s already at retailers as part of the second series) As predicted, it was a bloodbath trying to get him, with fans lined up outside the doors for hours before the convention opened solely to get their chance at a Boba Fett and his very special accessory. The set sold for $45. 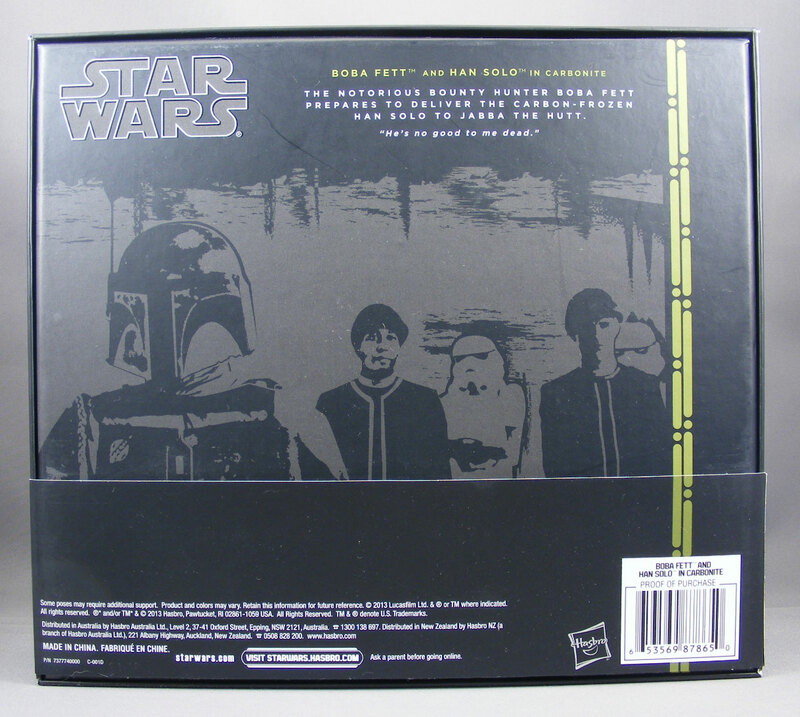 The front of the packaging is made to evoke Boba Fett’s iconic helmet, while the inside shows off the figure and its accessories, complete with descriptions of the weapons and jetpack. 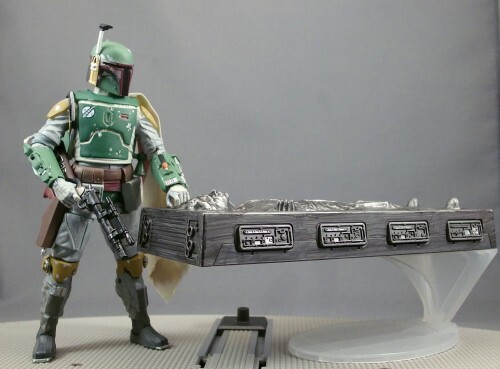 One place I’ve had no complaints with Star Wars Black is in the sculpting, and that holds true for Boba Fett. It’s excellent, highly-accurate, highly-detailed work. There’s some nice texture work on the helmet, clothes, and armor, giving the figure just the right lived-in, battle-worn look. It’s probably worth noting that Fett’s head is hollow – no clone head under there, thank heavens. 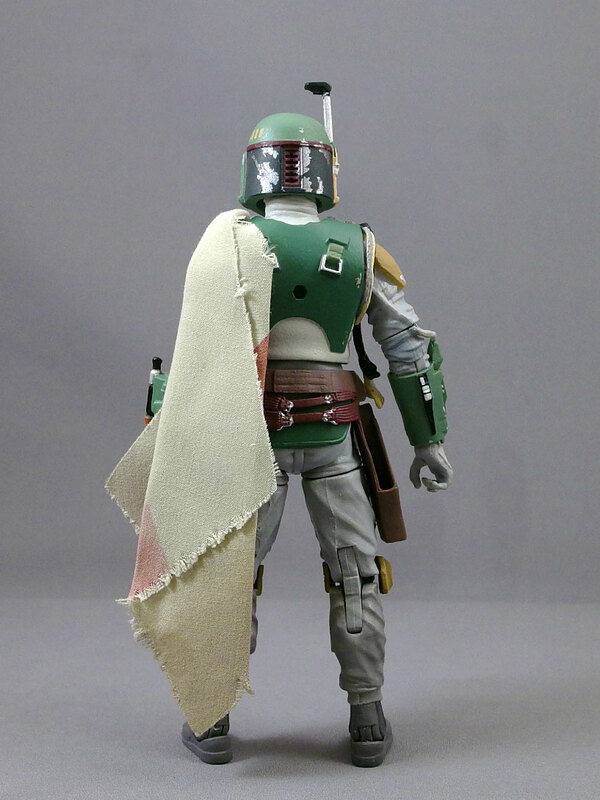 I’m never a huge fan of fabric on action figures, but Boba Fett’s cape is one of the rare exceptions where I think it’s probably the best solution. Anything else would probably just look wrong or hurt the articulation. Hasbro has been pretty good about consistently using a kind of stiff fabric for the cape, which allows it to hang properly on the figure. It really only looks bad in close-ups. The only aspect in which this figure disappointed me was the articulation. Hasbro has done a great job with the articulation on this line, for the most part. Boba Fett is super-articulated, but the figure’s outfit, plus some specific choices in the articulation, make it not quite as satisfying as I’d hoped for. The right arm has the biceps swivel with the hinged arm because of the wire running down the back of Fett’s elbow to connect to his gauntlet; this allowed Hasbro to protect the wire from being stretched and possibly torn, as it might be with a regular ball-and-hinge elbow (as often happened to the first NECA Aliens Warrior). However, this is one of those super-articulated figures whose articulation is quite restricted by his outfit. The range of motion on the hips is held in by the two pouches, while the arms really could have used double-hinge joints. I’d have been happy with the elbow-wire being sculpted into the arm and broken up by the articulation if it meant we got a double-hinge. The wrists of the other three SWB6″ figures have had up-and-down hinges on the right wrist and left-and-right on the left wrist. Boba Fett has only left-and-right hinges on both hands. 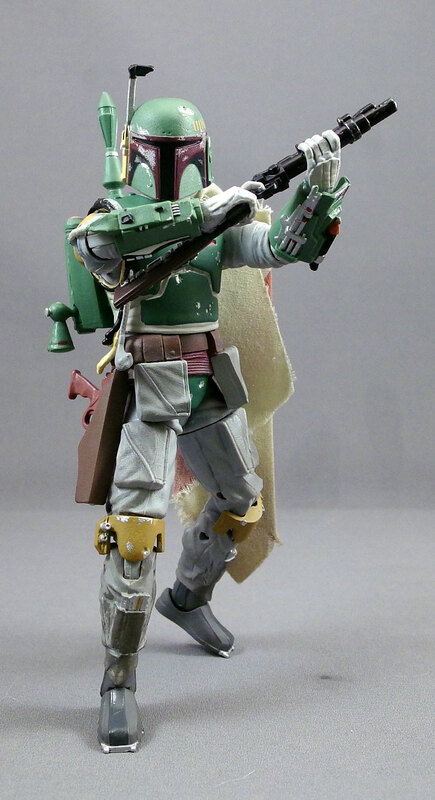 I have mixed feelings on this – I really like the up-and-down hinge on the right hand – but I think the R/L hinge is necessary here to give Fett any chance of a decent pose with his rifle, due to its large stock. You need to angle the right hand inside in order to get the gun held properly. One other disappointing aspect of the articulation is the rangefinder on the helmet. Why isn’t it articulated? Hasbro’s done that for a number of its 3.75″ figures, so I find it perplexing they didn’t do it in this larger scale. Another thing to add to a future ROTJ Fett. 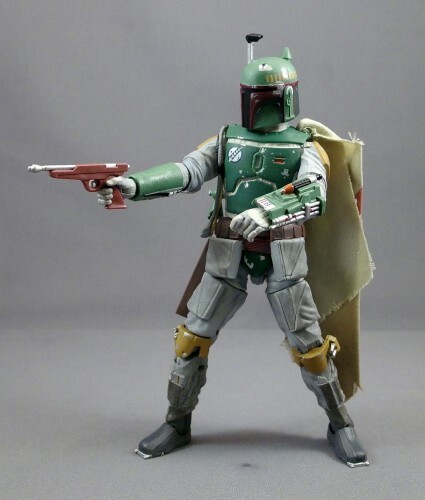 Fett comes with three personal accessories: a removable jetpack, his BlasTech EE-3 blaster rifle, and his Sacros K-11 disintegrator pistol. 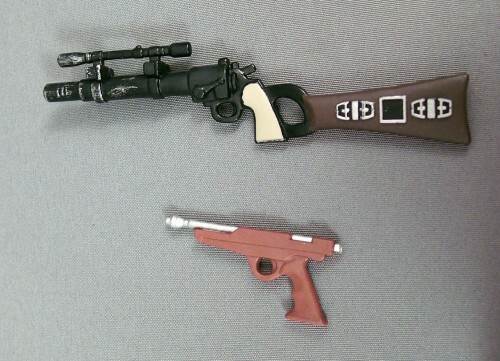 This is some nice fabrication, and they even get paint applications (multiples in the case of the blaster rifle). There’s not a whole lot of paint work on the jetpack, which is accurate to the film, but what there is looks good. 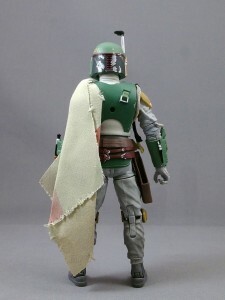 Of course, the real selling point of this SDCC set isn’t Fett, since you can get him right now as part of SWB series 2. 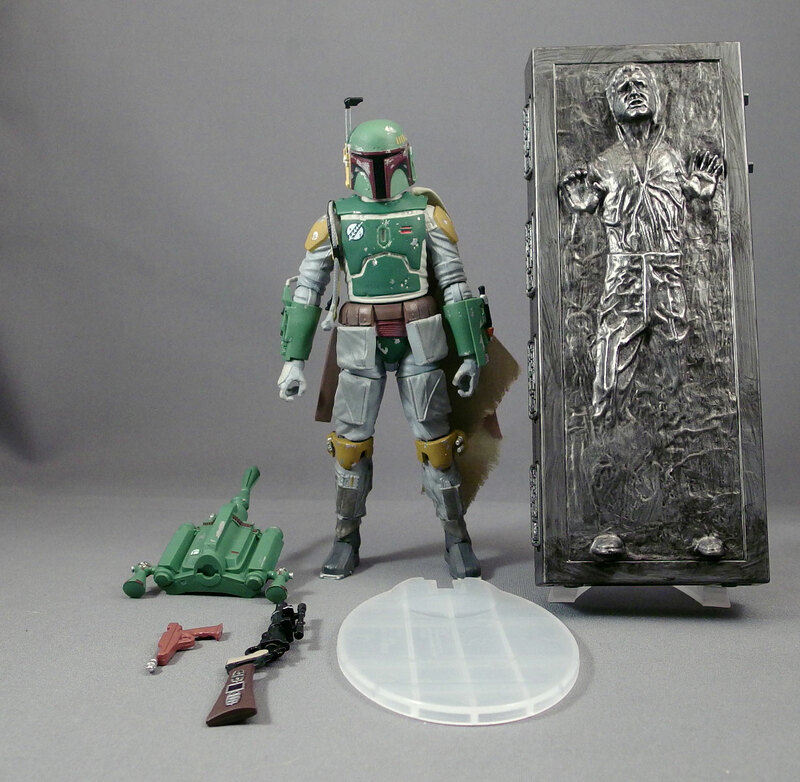 The reason to get this particular set is for its accessory: Man in Carbonite, a.k.a. Han Solo. One thing I’ve always wondered about the carbonite-freezing scene in ESB: Han’s hands are tied as he goes down into the freezing chamber. Why are his hands up when he comes out? Did he get his hands untied, Houdini-like, in a race to escape before the freezing gases hit him? Again, there is some great sculpting here. If there’s any negative about the figure, it’s that the dry-brush work is a little amateurish, although it’s really only noticeable on the flat panels. Han in Carbonite comes with a great stand that allows it to stand vertically or “hover” horizontally. 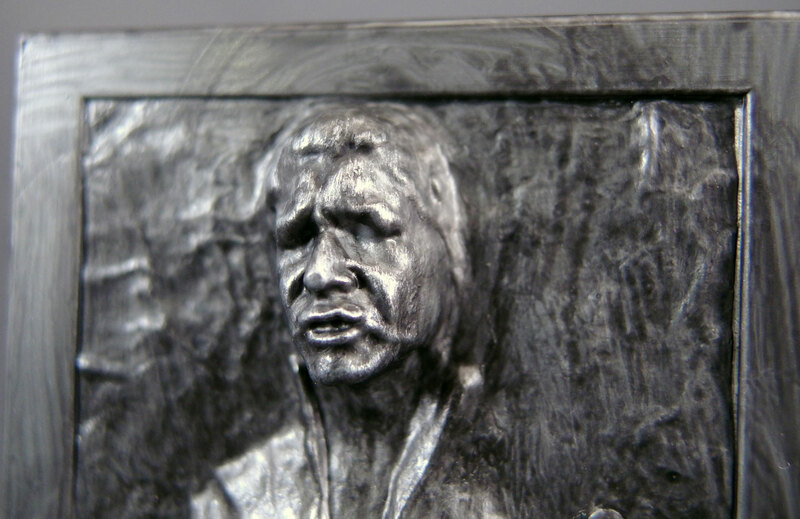 I hate to say this, because I know how incredibly frustrating and irritating to want an SDCC exclusive and not be able to have it, but Han in Carbonite is awesome. Fortunately, Hasbro has hinted they will find a way to make it more widely available to fans in the future (although I’m sure it will have some minor differences). As for the figure overall, the only negatives are the somewhat restricted articulation and the lack of an articulated rangefinder (which really bugs me, although that’s more of a personal preference). At $45, this set was overpriced – if SWB figures cost $20 apiece, it doesn’t make sense that Han costs $25 himself. At the $150+ it’s going for on the aftermarket, I don’t know that even I, in full-on SWB obsession mode, would cave in. That said, it is out there if you want it. Or you can just pick up Fett himself at these fine retailers. 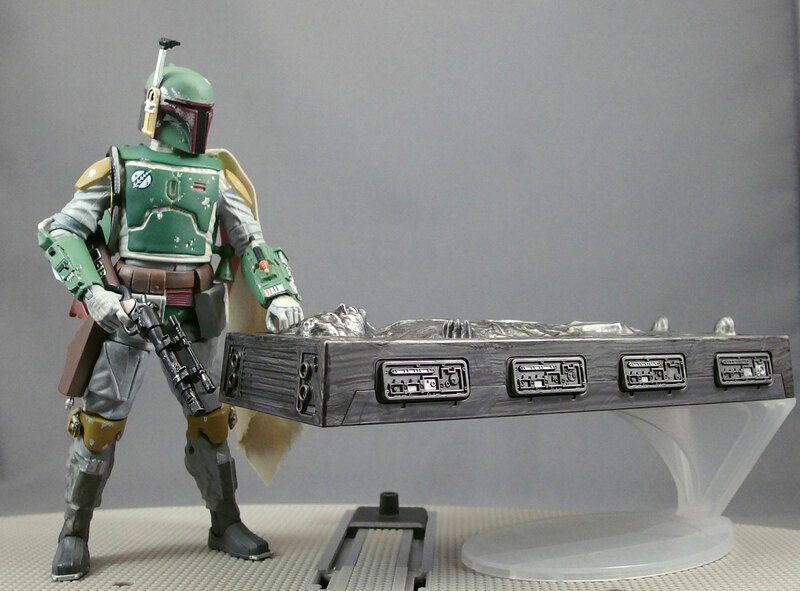 It looks like even the mass-market version of Fett will be a fast seller, but if you’re interested in getting one for free, be sure to enter our Trygg Poftu Star Wars Black Contest! Only one entry so far! That means if you enter right now, you have a 50% shot at winning! That Han in Carbonite is quite wicked indeed. I love the stands that he comes with! The rangefinder not being mobile bothered me too. I love, love, love this figure (my review will pop up Monday) but there are a few details that the Vintage Collection figure did better such as the Wookie braids and the removable helmet (still a cool feature, even if some people don't like it- Just leave it on!). 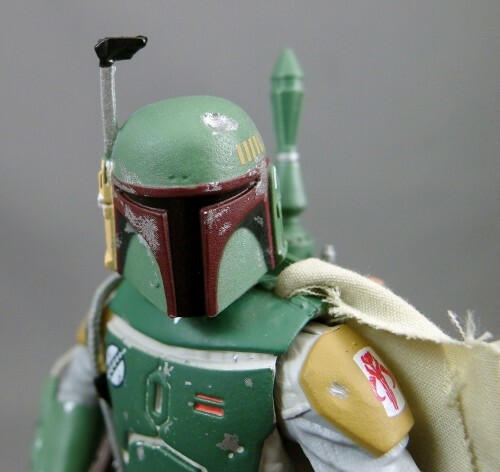 I am against removable-helmet Boba Fett figures on principle. That the only recent 3.75" Boba Fett without Temuera Morrison's face is a 5-POA throwback is a source of endless frustration. 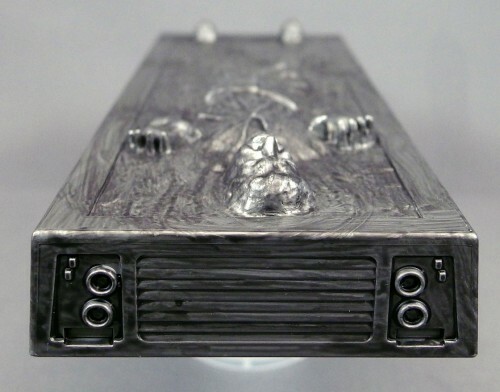 The new Han in Carbonite will probably have some red paint apps or translucent plastic – you know, "mid-thaw," like a lot of the 4" scale toys. 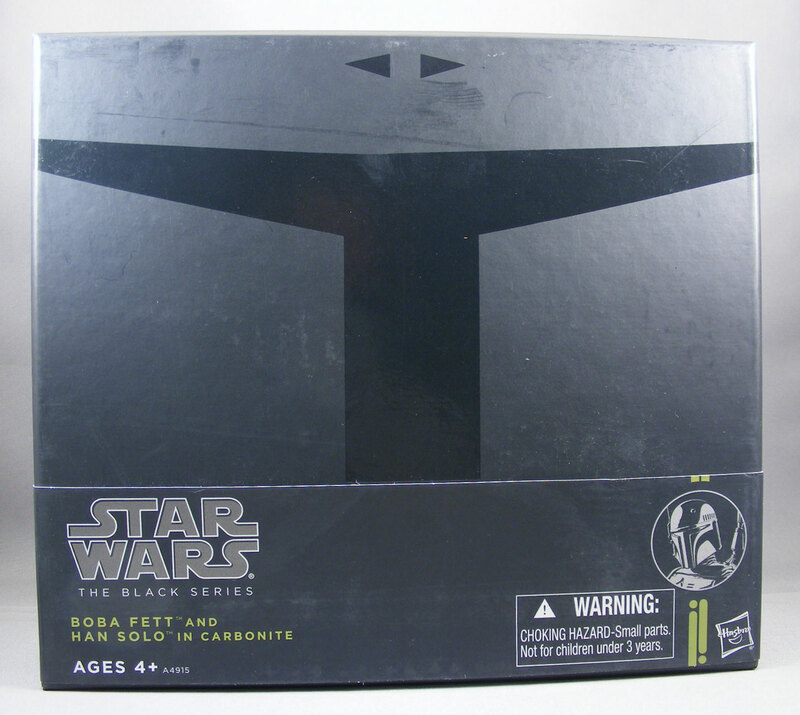 Is the Carbonite brick open on the back so you can fit Han inside? No, it can't be opened (well, it could be if you wanted to pry the panel off, but it might break it). There's not really enough room to fit him even if it did open. Actually, the ROTJ costume is slightly different from the ESB version. Obviously, the colours not quite the same (dramatically so in the case of the rocketpack), but the belt is also different (more ammo pouches), there's no holstered blaster pistol, the boots have added "spats" and the vambraces/weapons-platforms have been modified. Well, I’m sure that the ROTJ version will be designed accurately (if they so it), given the differences between the sandtrooper and stormtroopers. I hope they do the ROTJ version, though. That was “my” Boba Fett, since ROTJ was the movie I made the most connection with as a kid. So far the films go, though, I think I've always been most attached to ESB for its strange, dream-like ambiance (at least outside of the Star Destroyer scenes), for introducing Boba Fett and generally treating him rather more respectfully than ROTJ and for the whole Hoth sequence (being Canadian and thus having an affinity for frozen, snowbound wastelands). I do love ROTJ nonetheless, though. To my mind, the Endor space battle has never been equalled on screen, the interaction between Luke and Vader is quite moving (though the emotionally redemptive implications of it are not always acknowledged by PT-era Jedi fans) and I'm one of the few people I know who actually likes Ewoks. 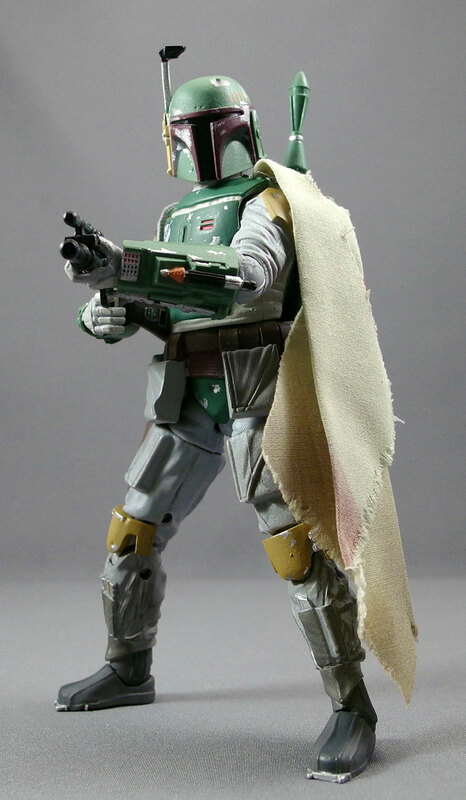 As for Fett himself, I think his second prototype costume, which the original Kenner figure and card-art were drawn from, is my personal favourite. 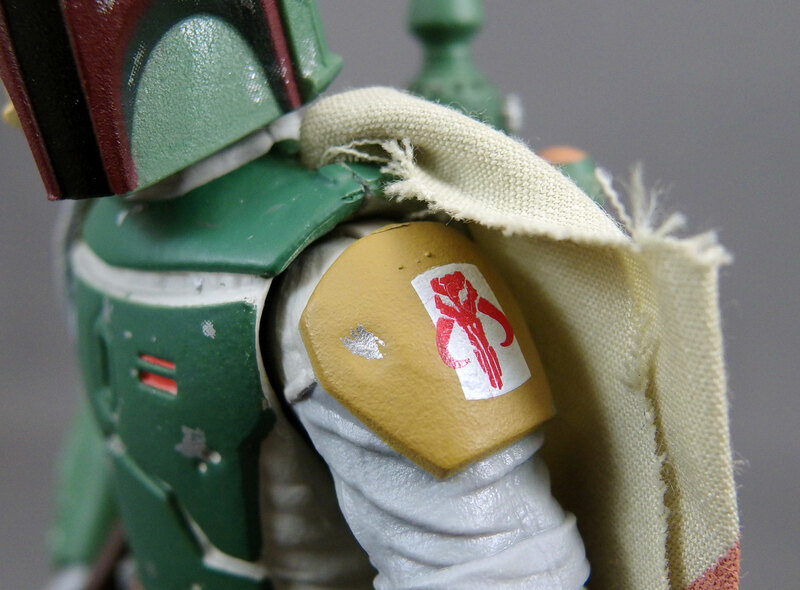 I like the asymmetry of the one vambrace being red and the other yellow, and the gloves are a little more visually interesting (and later set off a minor collector frenzy when Kenner/Hasbro attempted to replicate the design, for whatever reason, on their first, largely ROTJ-inspired POTF2 Boba Fett). And I certainly hope this line lasts long enough to see another Boba Fett.